IBM has a new blockchain partner to leverage the vast amount of data in current supply chains and transform it into operational efficiency. Supply chains have excelled at gathering this data to improve efficiencies in trade. However, increases in data have not been paired with an increase in trust. Data is kept within an organization, unable to benefit partners across a supply chain. Organizations are wary of threats from competitors, choosing to protect data instead of sharing with partners. Blind spots persist across the supply chain as organizations lose track of products and paperwork. There is no immutable record shared amongst all parties to track the origins of an asset to determine authenticity and quality. According to the World Economic Forum’s report Enabling Trade: Valuing Growth Opportunities, reducing barriers within the international supply chain could increase worldwide GDP by almost 5 percent and total trade volume by 15 percent. In comes blockchain. 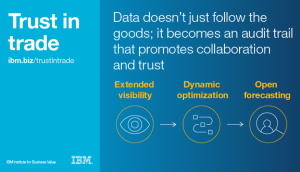 In the IBM Institute for Business Value’s recent Expert Insights report, Trust in trade: Toward stronger supply chains, industry experts recognized blockchain as a technology to be leveraged across supply chains to see breakthroughs in visibility, optimization and forecasting. Current shipping processes are paper intensive, causing frequent and costly errors. Blockchain can enable organizations to get more data on shipped supplies, reducing risk and raising the bar on the quality of products and distribution. Organizations will gain greater visibility over the products in their supply chains, allowing them to reduce waste, spoilage and defects. Blockchain also allows organizations to synchronize audit trails between partners in a supply chain and begin to optimize in real time. Audit trails can expand the circle of trust across a supply chain, making decisions easier at every level. Finally, blockchain could enable data to be shared instantly to all permissioned participants in a network. Partners can collaboratively forecast to improve efficiencies across the supply chain. Advanced analytics and cognitive capabilities could enhance this decision-making power. Organizations can achieve these benefits by using blockchains to build trust in the most important parts of their operations, develop partnerships to expand the data available to assist decision making and create differentiated values for customers and partners. IBM is already working with partners to make these benefits a reality. IBM and Maersk just announced a new collaboration to leverage blockchain, cognitive computing and other technologies to create a global digitization network for information sharing in international trade. As stated in the announcement, the shipping industry carries 90 percent of global trade annually. IBM and Maersk are putting 10 million shipping containers on blockchain, creating a new global supply chain network with potential to increase global trade and impact worldwide GDP. This network will be built to digitize supply chains, enhance transparency, improve security and enable trust. These efforts are the first steps in enabling new breakthroughs for supply chains.